Great stories, and unforgettable memories all take place around the campfire but what do you do if your matches get wet or they were left behind? Don’t Worry — you got this. Great stories, and unforgettable memories all take place around the campfire but what do you do if your matches get wet or they were left behind? Don’t Worry (pause) You got this. It’s all about being prepared so be sure to bring some alternative fire-starting tools. Whether you’re starting a teepee fire for warmth or a log cabin fire for cooking, having a method of creating a spark and easily combustible material is key. 1. Gather some tinder and kindling from around your campsite to make a fluffy nest out of flammable elements like bark or dry grass. The finer and dryer the materials the better. 3. 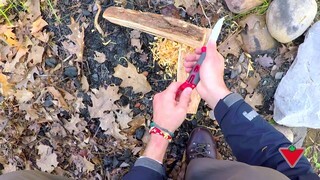 Using the flint striker – strike toward tinder pieces to create a spark and your tinder will soon catch fire. 5. Slowly add more tinder and kindling. Soon enough you’ll have a roaring fire fit for marshmallows, hot dogs and ghost stories. Starting a camp-fire? Don’t worry – you got this.